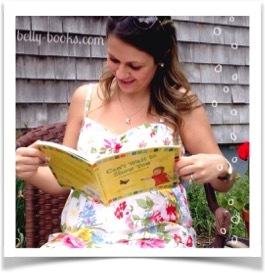 Reading to the bump: Why not give it a try? If you’re expecting a baby, you might already be clued in to the huge importance of daily read-aloud starting right from birth, and all the developmental, social, and family-bonding benefits it brings. Well, there is a growing body of research (just check out the links in our sidebar!) 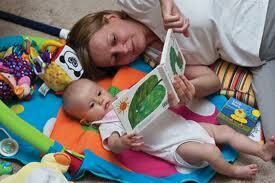 showing that all these benefits can be enhanced if daily read-aloud starts even before birth. Yes, your baby’s ears are already developed enough by the third trimester for her to hear and recognize your voice and even to start picking up on the rhythyms and melodies of your speech. This fosters not only her brain development but the bond you share, because by reading aloud you’ll naturally be communicating your love for her. You’ll also be showing her the joy and magic of language, and she’ll be fascinated and calmed by poems and stories when she hears them as a newborn. This is your chance! Why not give it a try? What if you do notice that the book you read over and over to your baby in the womb turns out to be the best way to soothe her after she’s born? What if storytime does turn out to be your new family’s favorite daily routine? And baby does turn out to be especially curious and connected, a lover of books and learning in general? You’ll be so glad you gave prenatal storytime a try! Lead the way for the new generation of parents who embrace reading, talking, and singing to their babies even before they meet in person. Talking Is Teaching Is Love!